The colors in the pictures on your monitor may not exactly match the colors in the products when you receive them. Every computer monitor is different and will therefore show colors differently. I have given detailed color descriptions in order to help you make a perfect selection. Because the neck on the display manequin is smaller than life size, the necklaces will hang to a different length than pictured. In some instances, your piece may hang longer than pictured because I have pulled the necklace back in order to capture the best view of the focal beads or pendant for the photo. For these reasons, it is important to pay close attention to the length given in each necklace description. I measure clasp to clasp (beads only) and measure the length of the pendant separately. Much of the beauty of the beads and scarves is lost due to my (lack of) photographic skills. The pictures simply do not do justice to these pieces. Suffice to say that if you are pleased with the look of an item on the screen, you should be pleasantly surprised when it arrives in your home. Click image for larger view. 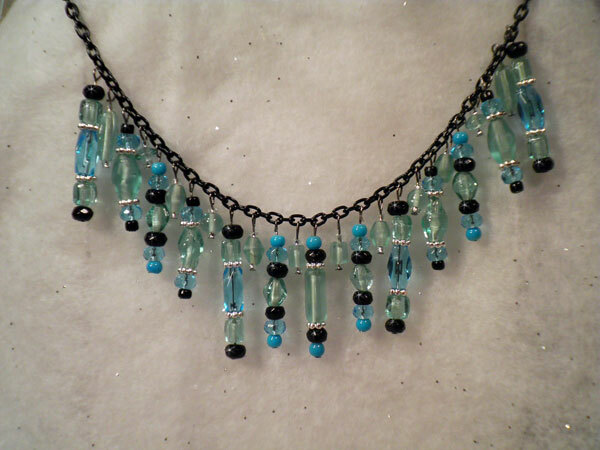 This piece measures 20 1/2" and is a sparkling mix of varied-shaped mint green glass beads (some clear, some frosted), glass rounds, faceted discs and faceted rectangles in turquoise, seeds and fully-faceted glass discs in black, silver seeds & silver spacers all assembled onto a beautiful black chain and finished with a black toggle clasp. I always love the blue/green combination and this is no exception! *Items are one of a kind. You will only be able to purchase one of each piece. *Don't like ordering online? We do have alternate payment options that can be worked out with me through email.